While I could bore you with the details of how Ben suggested we do the Star Trek Reddit gift exchange, and how I am extremely nervous about gifting strangers handmade gifts because I’m afraid they will be seen as the golden macaroni pencil cup.. 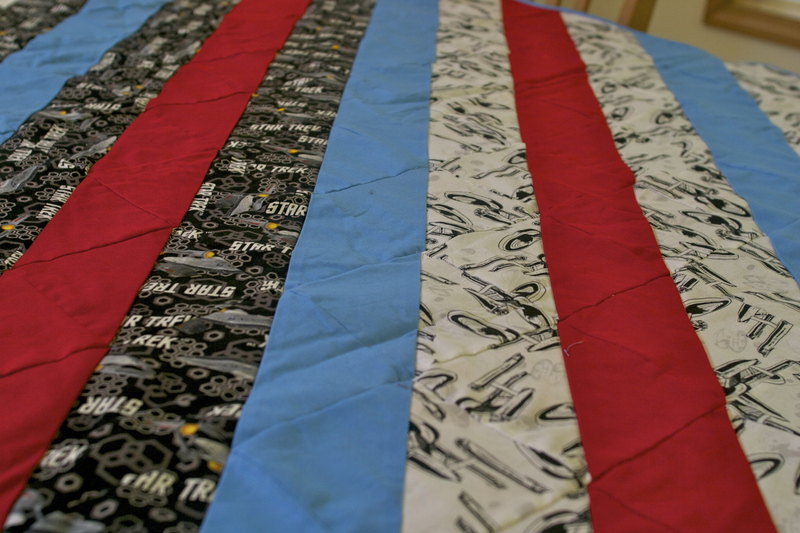 I think instead I will just post the silly little Captain’s Log Story I sent with my giftee’s quilt (and of course photos!). While on our way to check on one of the outlying colonies, Mr. Spock noted the presence of several indicators of intelligent life in an adjoining star system and I’ve decided to check it out. Meanwhile, we have been hailed by a being who says her name is Materialanna, representing the Textilian Homeworld. They are claiming we have caused a rent in their space-time fabric and demanding we sew up a suitable patch. Spock is concerned about the inconsistency of a species that seems to view space-time as a fabric, and yet has the ability to stop a starship. 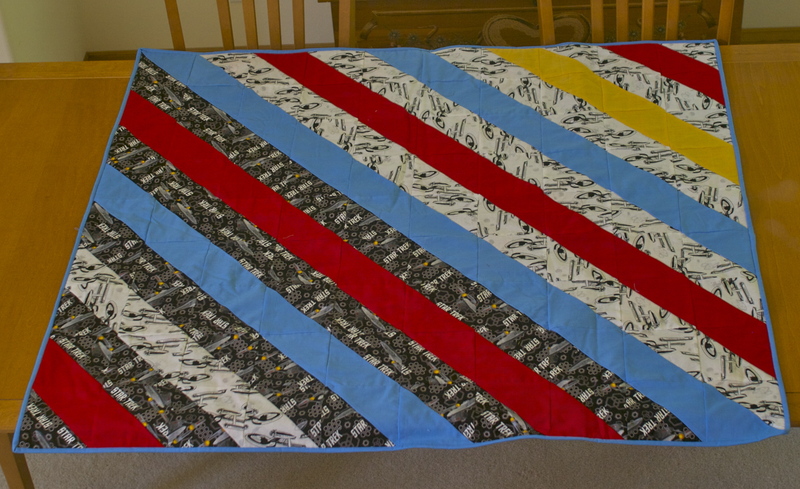 I have decided at this point to go along with their quilt patch plan, and if nothing else, that will hopefully give Mr. Scott the time he needs to figure out how to get the Enterprise moving again. I assigned Dr. McCoy to the seaming of our patch fabric. He mentioned something about “Doctor Not a Seamstress” and “Hospital Not a Sewing Circle!” but after reminding him he had the most stitching experience of anyone, he agreed to take up the task in one of the storage bays. 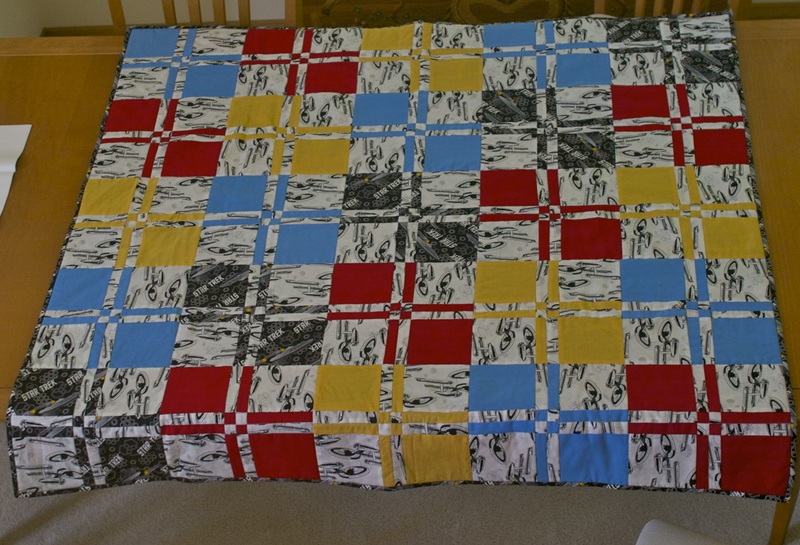 The quilt patch is complete! The Textilians have accepted our patch piece and assure us that it will be sent to the proper place and time. Mr. Scott is reporting full function of the Enterprise. Inexplicably, Mr. Spock has noted that all signs of life in this system have ceased to register on his scope. And I made one for Ben’s giftee too. He helped with the layout, and even ironed once! These two babies are already wrapped up and in the mail. Normally I wouldn’t post gift items until they were received, but in this case the giftees do not have any idea who is gifting them so it is all still a mystery. These two are backed with a classic trek fleece which was a first for me and I think they turned out pretty well. I will update with a link here if they post about getting them. UPDATE: Ben’s Giftee posted about getting her items. UPDATE #2: After no tracking updates since Tuesday… my giftee got his gift! Do you sell your quilts!? 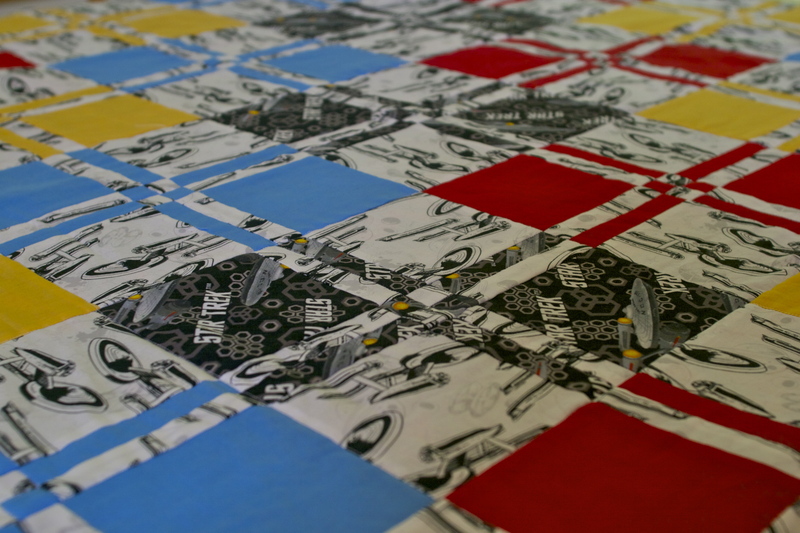 I would love to buy a Star Trek crib quilt! Thank you. I have not sold them before, they have all been gifts. I would be open to making one to sell. Send me an email at carla(at)misscarlotta(dot)com.